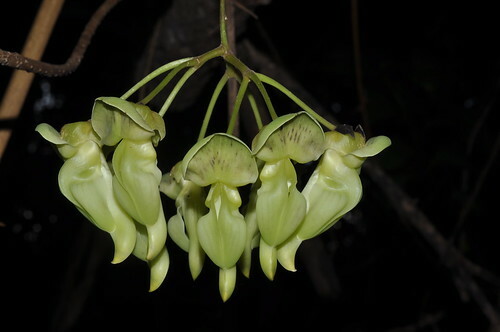 This native vine is nowhere as grandiose and flashy as its exotic New Guinean relative Mucuna novo-guinensis but there is something subtly and quietly beautiful about the cluster of light cream yellow flowers that hang gracefully from a long pendant stalk. I picture the grace of ballet dancers. 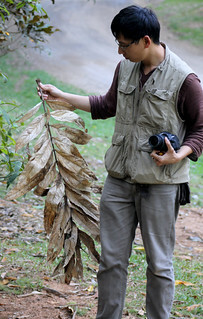 The seed pod ripens black and are often covered fine irritant hairs – a rather common trait in some species of Mucanas. The slightly flatten black seeds are often referred to as Burney Beans. These seeds are buoyant and can be dispersed by water or ocean currents and to withstand such rough rides, these seeds need to be durable. As such they have a hard coat – a trait that has led to its prominence in modern and ancient seed jewellery making. 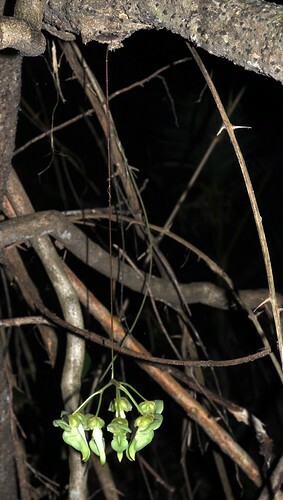 This entry was posted in Fabaceae (Pea family), Habitat - Rain forest, Lifeform - Climbers and tagged Black Bean, Fabaceae, Mucuna gigantea, velvet bean. Bookmark the permalink.